Concentrated Photovoltaic (CPV) technology produces unparalleled energy output by combining concentrating optics with tiny, highly efficient Quantum cells. The technology minimizes the amount of PV materials required, maximizes energy production, and reduces the energy generation cost. CPV systems utilize multi-junction cells that are designed for the unforgiving en-vironment of space where temperatures can be in excess of 200°C. The MJ cell has an excellent temperature coefficient providing significantly more energy than silicon technology in hot climates. 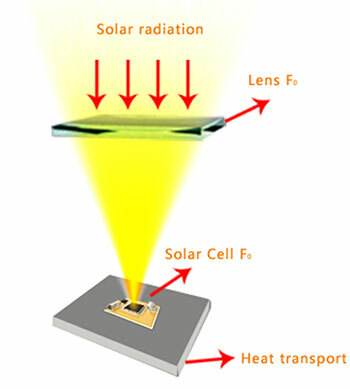 The core components of a CPV system are MJ cells, concentrating optics (refractive or reflective) and dual-axis tracking which provides peak power for up to 10 hours per day. Low energy consumption, no pollution, and truly eco-friendly.